The history of Seneca caverns is long, you could say it started over 460 million years ago. That's when the limestone bed where the Caverns formed was laid under an inland sea. Limestone is formed from the remains of shells from clams, coral and other shellfish, which settle on the bottom of the sea over time. The first verifiable history of human contact with the cave was in the early 1400's when the Seneca Indians used the cave. 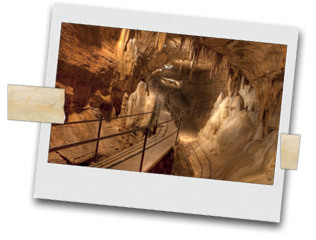 The Caverns are located on a great Indian trading route through the Appalachian Mountains. Many tribes used this trading route but it was the Seneca Indians who lived here and used the cave for shelter, storage and special ceremonies. Three hundred years later the first German settlers came to the area. As history goes, a man named Laven Teter rediscovered the cave in 1742 on a quest for water to supply his livestock. At this time the area was not even considered part of the original 13 colonies. The Teter family maintained ownership until 1928. The new owners opened it to the public in 1930 as a show cave.